Mardi Gras has a wild party atmosphere in New Orleans and other cities along the Gulf Coast that hold celebrations. Costumes are a popular aspect of the celebration, as people commonly dress up for Mardi Gras balls, parties and parades. A good costume can even make it more likely that people riding on the floats will throw you beads. Get creative when you create your Mardi Gras costume and remember that you can't dress too wildly for this celebration. Masks are traditionally worn by revelers at Mardi Gras parades and parties. 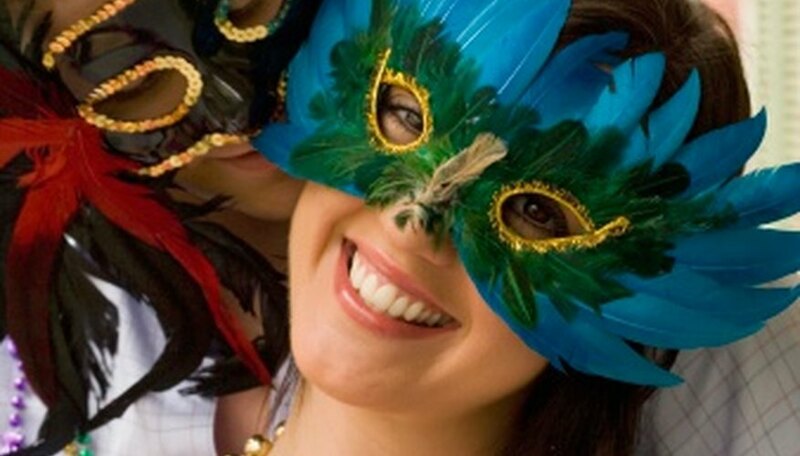 Purchase a mask covered in sequins, feathers and beads in the traditional Mardi Gras colors of green, gold and purple. You can also make your own Mardi Gras mask using poster board, paint, embellishments and an elastic band. Choose a large mask that covers much of your face and extends above your head. Another common Mardi Gras mascot is the court jester. Jesters are traditionally known for wearing a costume with fabric that features a diamond pattern in bright colors. Wear a jumpsuit made from that pattern or a long robe. Complete the jester costume with a large, tri-colored hat. Paint your face with the same colors that are involved with the costume for an over-the-top look. When you are attending a formal Mardi Gras ball, you will need a formal outfit. Dress codes are often strictly adhered to for these affairs, so inquire with the event organizers about any dress code that you might need to follow. Women at formal Mardi Gras balls often wear floor-length dresses in bright colors. Men are often required to wear tuxedos. But you can choose a vest or a tie for your tuxedo in bright colors or a wild pattern. Rather than choosing a traditional Mardi Gras costume, create a wild and colorful one that is all your own. Remember that anything goes at Mardi Gras, so you can't go wrong. For example, wear a leotard and a tutu and pair it with a feather boa and a large wig. Choose a random costume that will catch the eye of people riding on floats, such as a bear outfit or a clown costume.